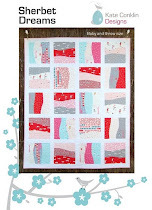 Kate Conklin Designs: Sherbet Dreams and a Giveaway! Sherbet Dreams and a Giveaway! Ever since designing my Sea Views quilt, I've wanted to try another simple design with curved piecing. When I got my hands on one of Aneela Hoey's fantastic Sherbet Pips layer cakes (42, 10" squares) it was the perfect time to give it a go. And thanks Dane for helping out with the photo shoot. As the yardage wasn't out yet, I found this red/white dot fabric, but was a little nervous that it might bleed onto the quilt, so I washed it, and then it wasn't wide enough anymore - doh! So I tried piecing a long wavy white line down the back. After some trial and error, I finally got it to work without puckering. It's great how mistakes can push you to try new things. 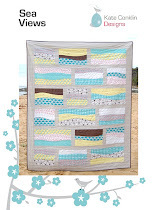 So, now to the giveaway... to win half a Sherbet Pips layer cake (21, 10" squares - enough to make this quilt) as well as the Sherbet Dreams quilt pattern, just leave a comment telling me a favourite childhood memory. It could be something funny, naughty, an accident, a favourite past time... whatever. The giveaway is open to everyone and I'll randomly pick a winner Tuesday 1st March. - Giveaway closed thanks! A childhood memory that comes to mind is when I scribbled all over my baby sister's face with pen. I don't actually remember doing it, but there's photographic evidence, and I wouldn't put it past me (sorry Amelia)! The Sherbet Dreams pattern (containing instructions for two sizes, but not the pieced back) is available from my downloadable patterns page and will be 20% off until the giveaway finishes. I would love a chance to get my hands on some Sherbet Pips!! Wow, I love the wavy line on the back! I remember that whenever my brother and I were getting along and having fun together my mom assumed something was wrong! Your quilt looks great! I love the name and the backing looks fantastic with the wavy white line! One of my favourite memories is of playing cards with my Aunt who lived next door, we would sit on her front porch and she taught me to play a few different games, unfortunately I haven't had the opportunity to play cards in years. My favorite childhood memory is playing restaurant with my brother. We made up a menu on the computer, along with little pictures for the food (grapes, a pizza, etc.). Then we'd pull out a play picnic basket set that we had, with all the dishes etc. and one of us would be the waiter. It was really fun! Oh I can't wait for April myself. As for a childhood memory that comes to mind is me sneeking to use the sewing machine. I wanted to make a top for myself and had the perfect design in my head. Straps and all. I didn't want to measure or cut - just wing it. Things didn't turn out that grand s I never wore it . . but I did use the machine. I'm sure my mother was just out of view. My favorite childhood memory is Saturday's with my dad, just me and him, at the park feeding the ducks and swinging. Really looking forward to this fabric. One of my childhood memories is when my Grandma and Grandpa would come to visit for the winter. They made everything so special. Grandma always cooked the best meals and made dessert and Grandpa would make things out in the garage. Thanks so much for the lovely memory. Haven't thought of them in a while. oh, and thanks for the giveaway too! I love the simplicity of the pattern, but I'm betting its a lot harder than it looks- I'd definitely have to practice before cutting up sherbet pips. A childhood memory of mine is going to the fair with my younger cousin who was convinced he was going to throw up on the pirate ship.. it's not easy to get those guys to stop a ride while you are on it! beautiful quilt! one of my favourite childhood memories was going out to the big rocks along the beach in the summer time with my cousin and grandfather to catch crabs! we don't usually catch a lot, but it was so much fun! thanks for the giveaway! The first that popped into my head was playing "teacher" with my brothers. My parents had these great old school desks with attached seats in the basement and we used to go do and take lessons. I was always teacher (the only girl) and I was usually harsh with my punishments when they were clowns, making them do lines or walk 100 steps and things like that. It was a lot of fun. The whole thing really filled a lot of our time. I'm sure my mother was thankful for that. I was probably about 2 years old and my parents placed me on the kitchen counter. They must have left the room because when they came back, I was covered in cinnamon! I would like the money, but please leave my tooth. My mother still teases me about this. That is a sweet quilt Kate!!! I love the name, and the design. It's a great way to use pre-cuts and how nice of you to share the leftovers! My fav memory is one that took place every summer. It was my sister and I lying in the back of our station wagon on top of our sleeping bags, colouring with crayons in our colouring books all the way (3 days driving for a family) from Toronto to Nova Scotia to visit our grandparents. Our two brothers had to share the back seat, but us 'big girls' would get the whole back (all of our stuff was in the tent trailer being pulled behind). This was long before people strapped their kids in! Inevitably, we'd stop to visit some fort, or museum, or Dairy Queen and come back to find our crayons had melted into soup in the hot summer sun! My favorite childhood memory is going on night swims in the pool during the hot summer nights. Love the pattern! I remember sitting next to my mother all curled up while she read to us 5 kids, all of us vying for a position right next to her. When my dad took me to work on Sat. with him and he would set me up a desk with paper, stapler and tape. Then took me to lunch. I thought I was a big girl. Some of my fondest memories are playing Blinds Mans Bluff in our very dark long hallway with my sisters and cousins, it was so much fun! Can't wait to see Sherbet Pips in the flesh! Lovely Quilt too! My favourite childhood memory by far is summer vacations at the lake! What a gorgeous quilt, Kate! My favorite memory - we lived on an old, old street with huge maple trees in the parking strip, and every year there was a huge rain of those little whirligig seeds. Me and my sister and the two neighbor kids would gather them all up in a wagon every year and then have this joyous, crazy maple leaf parade where we'd travel up and down the block throwing whirligigs up into the air and watching them fall. Please pick me! I love this fabric and your pattern is so cute! I clearly remember locking my brother and sister up in our stuffy little attic to play 'school' - and during the school holidays, no less. I remember getting quite frustrated when they weren't attentive or studious. Poor little ones. I have been in love with this fabric since it first starting surfacing on the web. I can't wait to get my hands on it and your pattern is awesome with it. I remember practically living at my best friends house, which was right across the street from me, every summer. We would spend days at the pool and riding our bikes to Highs to get slushies. It was the best!! My brother had a water bed--a really, really sloshy one--and a world map pinned to the wall at its head. We would put on eye patches and bandanas to go with the cut-off jeans we always wore, grab the paper-mache parrot we'd bought at Disneyworld and the red and black spyglass and go off on a nautical adventure! When the seas got rough, we practically jumped on the bed, and more than once we fell three feet to the floor as we walked the plank. I don't know how the bed never had a leak, but what brilliant times! Pirates of the Caribbean has nothing on us! My favorite memories are of playing with my big brother, racing down our long hallway and hurling ourselves into a pile of cushions at the end. Your new pattern is beautiful, and I'd love to learn about piecing without pins! One of my favorite childhood memories is swimming in the ocean with my daddy. I would hold on to his foot and we would swim to the sandbars. Just gorgeous Kate...well done & I love the pieced back. Wonderful quilt, front and back! The night before school pictures in kindergarden I took my mother's good sewing scissors and cut my bangs, right down to the scalp! Yep, there is photographic evidence of it! Love the quilt! One of my childhood memories involves my now-husband. He was friends with my older brother and one day we played I'll-show-you-mine-if-you-show-me-yours (I was all of about 5). Then we wrapped up in blankets and ran through the house. I got a talking to from my dad when he caught me, lol! I love your new pattern, Kate! The back is fantastic. I vividly remember our family trip to a state park when I was about 6. We went for a hike in the woods and got terribly lost! We wandered in circles for hours. By the time we found our way back, my sister and I were hysterical. My poor parents! I grew up on a wheat farm and I have fond memories of harvest time. Always a few days of excitement! This quilt is a fabulous use of this line of fabric. Favourite childhood memory? I was about seven years old, and though I knew that my momma grew up on a working farm, I had never seen it for myself. One day while we were visiting her dad, a cow and her calf had escaped the pens. My sister and I watched from the bathroom window as our momma herded the cow and the calf back into their pen. I saw my momma in a whole new light that day. A favorite childhood memory is sitting on the back of the sofa with my legs draped over my dad's shoulders and playing with his hair even with curlers! Hi, Kate! One of my favorite childhood memories is building massive house-of-cards cities in my grandmother's guestroom - she had so many decks of cards and we would build enormous skyscrapers, roads, houses, etc. It was a great way to spend rainy summer days!! On another note, I had to laugh when I saw your rocking horse - my granddaughter has an identical one that my sister found for her last Christmas at an antique store in Alabama! She loves that horsie.... almost as much as I love your quilt!!! One of my childhood memories is playing Lego with my brother in exchange for him playing Barbies with me. I think it was really just an excuse for me to play Lego, because it was way more fun! Oh, Kate, I just love this pattern, and I think this fabric line is just perfect for this pattern! I think one of my favorite childhood memories is putting on gymnastics shows in my living room for my family with my friend Crystal. We would choreograph our little routines to music and it was always so much fun. Yes, bring on April, can't wait for the yardages to come out. Let's see, a childhood memory I can remember is dressing my younger brother in my clothes. There's 4 years between us. I also remember sitting on him when we fought. 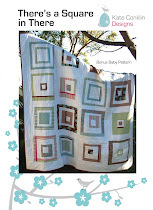 Love the quilt & as much as I like the name, I really like "Bend it like Kate"! I think my favorite memories involve my pasttime od collecting polywogs in a field down at the end of my street. I bring them home & watch them develop into frogs! Then at some point, they'd all be gone-they'd hop right out of the bucket! I have childhood memories of running a "restaurant" in my family's kitchen with a menu. We named it the Schnauzer Hauser, after our dog. I don't when I've been more enamored with a line of fabric than Sherbet Pips.I'd sure love some! I have great memories of playing house in the dirt on the farm with my sisters! Hi Kate, your quilt is adorable. As to my favourite memory, well it was a bad storm during the day and yep I was scared, then I saw my cat come running into my room, he was more frightened than me and I was suddenly not so scared and comforting him. He has a very special place in my heart. I don't know if this was normal practice where you grew up; but in elementary school, if you had a question, had to use the restroom, etc. -you raised your hand. Now, this one day I was in 3rd grade and wasn't feeling very good after lunch. So bad in fact that I knew I could vomit. So, I raised my hand hoping that the teacher would see me and let me leave to use the bathroom. Yet, she didn't see me. I felt so queasy that I broke the rule and went up to the teacher's desk to ask her...just when I reached her desk, I vomitted all over her, the desk, floor, etc. One of my favorite childhood memories is sitting under the quilting frame while my grandmas, my mom & aunt hand quilted quilts. It sure didn't take them very long to finish with the four of them quilting. My favorite childhood memory is definitely from when I was five. We had just moved into our new house, which had a huge finished basement (aka playroom), and my brother (age 3 at the time) and I just started unpacking/throwing our toys around. I don't remember being as carefree and happy as I was then! My favorite childhood memory was learning how to ride my bike when I was seven... I felt like I was so free, like I was flying! 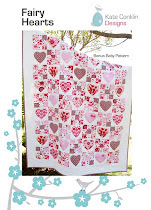 I love that quilt and I love the range of fabric, 'Sherbet Dreams'! !A fave childhood memory...playing 'tribes' on Fraser Island when I was little! I was Tara and carried a large spear (stick)- I was the leader of the tribe and we would explore all around the sand dunes...It was a long time ago - but such fun!! Oooh love that quilt and the fabric range looks amazing. My favourite childhood memory is having a sleepover at my grandparents house and following my Grandad around asking him 1001 questions plus the yummy food my grandma baked. The hikes in the mountains with my family are a sweet childhoodmemory to me! A favorite childhood memory is sitting on a fire hydrant in front of our house, reading a book, eating a plum. It makes me laugh to think of how much the 5 year old me was like the 45 year old me. Favorite memory? Running around in the rain on a hot February day, also my brothers brithday so we got to eat chocolate cake with bright green icing. What a stunning work of art that quilt is! I remember as a child playing "dress ups" in my Mum's beautiful ball gowns. They were simply stunning and I cannot believe she let us play with them! I've been looking for some Sherbert Pips and can't find it anywhere - it's not due here in the Uk until May I've been told, which seems unfair as Aneela is from the UK herself! I was brought up on a dairy farm so my earliest memories tend to include animals rather than people! oh the excitement when my favourite cow (Gnome - don't ask!!) gave birth to triplets - all alive!! 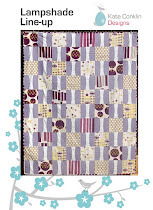 This quilt is gorgeous, love the curved lines! LOVE, LOVE your quilt, the fabric is so fun!!! Great fabric and great pattern! Oh my. This quilt really has me inspired to drag the sewing machine out and brush off the cob webs. A favourite childhood memory? Playing under our house with my brother, in the dirt, making roads and cities to drive our matchbox cars around in. Thank you for such a fab giveaway. 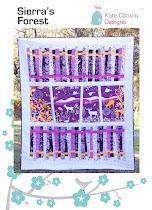 I really like your quilt design and I would really like to make it with the Sherbet Pips fabric. My favorite childhood memory is playing in the backyard until dark catching fireflights. Hi Kate my name is Sharon and it is so nice to meet you. You have a wonderful blog. i truly do love the flow of this quilt and the fabric are wonderful. One of my childhood memories would be with my older sister and my best friend and myself. We would get to gether 3x's a week for an hour each time and for that whole hour we would practice singing like the "Supremes" I mean we had the tamberines and everything we would use corn cobs for the mic's and we were going to be singers. Needless to say non of us are singers but we do talk about that quite a bit from time to time. I really would liek to be the lucky one who wins the pattern and fabric. Have a wonderful Friday. Hi Kate, good to see you made a new quilt pattern. I follow your blog and really like the patterns you make. Never bought one, but I will one day :). So, my favorite memory: as a child I spent a lot of time with my grandma and the thing I'll always remember is when she hit me with a snowball right in the face :). We were playing and she wanted to hit me in the back but I turned back and felt the snow on my cheeks. It was really funny and I smile to this day when I remind of it. Lovely quilt. The scooters look like skiers with snow falling above them in some of the blocks, with those lovely curves. I remember my dad pulling us to school one winter morning on a sledge, when the snow was too deep for him to drive to work or the school bus to run. It must have been hard work for him as it was about two miles, but fun for us! Oh! Beautiful quilt! My favorite childhood memory is when my mom brought home my first dog, a black lab puppy. Best.Day.Ever. Your quilt is gorgeous. I have never tried curves (actually avoid them) and I have been doing this for over 10 years. Childhood memory: Everyone needs a laugh right...my aunt and uncle took my camping and I sat in poisin ivy to "do my business" (I was about 12). We didn't know it and traveled home 12 hours in a hot car (before air conditioning). Needless to say infection set into places we don't want to mention. I was in my room that summer for 6 weeks bare from the waist down so that "things" could clear up. I will never forget that summer. That is the summer I developed my love of reading. A childhood memory I have is of all the fun vacations we would take to the Smoky Mountains... vacation week when my parents were off work was July 4th week and happened to fall on my birthday. So my birthday was mostly spent away from home in a motel room--we always had a big celebration and it was really special. So even today I think my husband should be on vacation and we should go on a trip on my birthday! My favorite memory is baking mini cakes in my easy bake oven. I would never let it cool long enough, so my icing always turned out like glaze :) It still tasted yummy. Oh, Kate, prepare yourself for an onslaught of people wanting pips!! Your quilt is GREAT! What a simple idea to use curves - It looks great - I love it!! I love this quilt and I love this fabric!! Thanks for the chance at a giveaway!! My favorite childhood memory...hmmm....probably all the time spent at the beach. I grew up on a lake and you had to drag me and my sibs from it every night! I guess I have always love the water...probably why I live on an island today! Love the quilt and can't wait to get some of the fabric. I remember Friday afternoon spent at my gran's house, then walking back over the Ferry Bridge to my dad's office, for my lift home. I forgot my childhood memory. Can we edit?? I remember camping with my family, listening to my dad read out loud to us before bedtime and working out synchonized swimming routines with my sister during the day!! your quilt is beautiful....can't wait for the fabrics to make their way to my LQS. Hoping for a win....keeping my fingers crossed. Hello! Found you through Aneela's blog. Your quilt is simply amazing! It's absolutely beautiful, such skills!!! My favourite childhood memory? Sitting on my grandad's lap, even when I was too big for it. He was the best grandad ever. My childhood memory is with my Teddy. One day, I just knew I was going to be a hairdresser, so I cut Teddy's hair. Only the stuffing started to fall out, so I took the adhesive tape and doctored him up. He still has the tape on him som 45 years later. 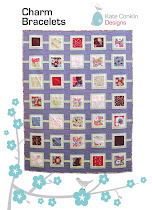 I love your quilt and am putting your pattern on the to-do list, hopefully with some Sherbert Pips! Well, I was very naughty as a child (being the youngest of 8 I think I was just looking for attention). My older sister (by 14 yrs) had a habit of getting her friend to ring her just as dinner was over so that she'd get out of doing the dishes. Anyway, I took it upon myself (at the age of about 3 or 4) to end one of these phone conversations by getting a large pair of scissors and cutting through the curly telephone cord! Oh,I have been looking for a new project. This would be perfect. If I had to pick a favorite childhood memory it would be camping along the banks of the Big Thompson in Colorado with my family in the early 70's. Great fun! Love the look of your quilt it's amazing. One of my favorite memories is when I was little my mom and dad left my older brother and me and two boys(twins) from my preschool class home with a sitter. One of the boys and I dumped almost a whole bottle of bubble bath in the tub and pretended to ice skate. It was super slick and surprising now to think no one got hurt. One of my favorite memories is going camping with my cousins in Canada. Great quilt! Love the wavy lines! One of my favorite childhood memories is a few neighborhood families used to gather at one house in the evenings and the kids would play kick the can while the parents talked on the back porch. Really fun (I was five). Creating a tent in the back yard with an old sheet and the clothesline and then dancing inside with my friends to my tapes of the Village People, Shaun Cassidy, and Grease! Da Do Run Run Run Da Do Run Run! Now this quilt is... wow! I love it! What a beautiful quilt! My favorite childhood memory is sitting at a bonfire with my family, way past my bedtime, on vacation at Lake Michigan. So beautiful! This is a lovely design for showing off the pips!! Swinging on the swings in my backyard was my absolutely favorite thing to do when I was little. Thanks for the chance! ooohh this is sooo dreamy! 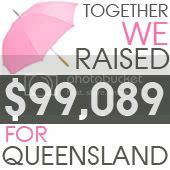 fabulous job! my favorite childhood memory is playing mug zombies with my brothers. we'd jump in the swimming pool, then roll around in dry soft dirt and let the mud crack all over our skin and chase each other around. we did it every day for a whole summer and never got tired of it. thanks for a chance at this RychUs quilt pattern! going to the beach every summer. The anticipation was high and all 3 children watching carefully being ready and the first to shout "I see the bride!" This indicated that in a few minutes, we would see the ocean and then quickly have our feet in the sand. This is a lovely quilt, it shows up the fabric really well! My favourite childhood memory is holidaying in Co.Donegal, splashing about in the wild atlantic! One of my favorite childhood memories is playing "ambulance" with my cousin in Barbados. We would take the farm cat and her kittens, turn the mama upside down and plop the kittens on her stomach. If that isn't enough, we would then each take the mama's paws and run around the house making ambulance noises, taking the kittens to the hospital on the "mama stretcher". I seriously don't know how we didn't kill that cat. Or, why she submitted all the time! I love this fabric and the quilt looks gorgeous - well done. Favourite childhood memory - autumn half term walking to see my dad at work scrunching through the dry autumn leaves with my brother. I love your quilt! It is lovely. My memory was the time my dad took our family to the local Dairy Queen for ice cream. The lady at the drive-thru was irritated that she had to make 6 ice cream cones. My dad drove around the block and came back and ordered 6 more. We thought that was the greatest thing he had ever done. I did not know until years later that he did it because the lady was rude. Kate, I love, love, love your design. It is perfect for the fabric! I remember as a kid, everyone piling into the station wagon and going to the drive-in movies where we would lay on the roof of the car to watch the movie!!!! Thanks for the giveaway! When we moved into our house with the balcony (off my room no less) my older sister and I saw it as an invitation to play on the roof. My mom was less than thrilled. So we souls wait until she left to play up there. I think it would be riding our bikes in our new house. So pretty! It may just be what gets me to attack curved piecing! 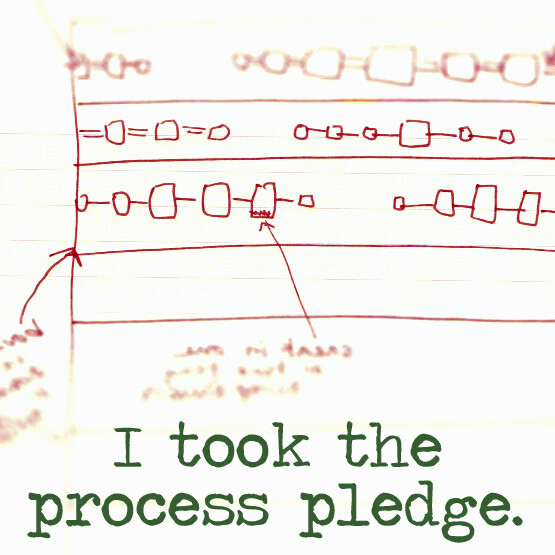 I remember biting my arm and saying my brother did it. He almost got in trouble until my smart mom realized my brother is 6 years older and had a much bigger mouth. Great quilt! Great pattern! Great fabric!!! Thanks for the giveaway! A not-so-fun memory is when as a young child in the 60's I stepped inside a phone booth and couldn't get out. It was the kind of booth with a bi-fold door but fortunately glass walls/door so my family did rescue me (I had wandered off). The door was difficult to figure out for a young one (similar to the door on airline WC). Suumer movies at the drive-inn!!! I went into a gas station for the first time in a looong time this morning and was reminded of when my dad used to take me to school. He would stop and get me a hot chocolate before heading in, and I loved it (I'm sure my teachers appreciated it too)! i love that quilt! my favorite childhood memory is of going to the public library. my mom would drop me off there when she got tired of my asking her a million questions and i think i read every book in the children's section at least twice. great quilt, love that fabric and can't wait until it is for sale! A childhood memory is when we had a pet duck and I used to walk him to the playground across the street with my brother. Not sure what my parents were thinking when they said yes to a duck! !We lived in the city. Favorite times were summers at my Grandmother's house in this tiny town in South Dakota! Favorite childhood memory - playing dress up with my barbies on the grass under the shade of the maple tree....ahh, those were the fun days! 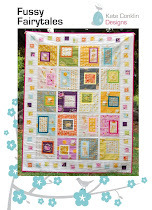 Your Sherbet Dreams quilt is adorable!!! My favorite childhood past time was swinging on the swing set in the back yard with my sisters. Thanks for the fun giveaway- I'm crossing my fingers! oh my...such a cute quilt..and I love the wavy addition on the back..perfect..
One year on Dec 23 my sister and I figured out that it was Christmas Eve Eve. So we ran around the living room singing it all day! It was so fun we did it for a few more years. Kate, another gorgeous pattern! A favourite memory (or at least one that stands out) is when my little sister gave my Cabbage Patch doll a bath in the toilet. I was mad at her for weeks! I think my favourite childhood memory is creating a hideaway of sort under my bed at my Grandmother's house. The bed was really high so I had books, a blanket, a pillow and a touch light under there; my Grandmother would always pretend that she couldn't find me even though I'm certain she knew where I was. Ever since I first saw sherbet pips, it reminded me of my own early love of swinging! We had a swing set in our backyard, & it was one of my favorite places to be. When alone, I'd sing from my swing . . . when I got in trouble, I'd retreat to my swing. It really was a comforting place for me. Probably one of the reasons I've been drawn to this fabric from the beginning & can't wait to quilt with it! I cut my sister's doll's hair. I wanted to try out the scissors, but knew better than to cut my own doll's hair. Her doll had to wear a beret for the rest of her life. thanks for the chance to win this fun fabric. great pattern! Children of yesteryear played outside ALOT! Seems we spent every waking hour out there. If mother had known what we kids were up to, she would have had a heart attack! We played at a construction site, RUNNING across the boards on the scaffolding three stories up; we played in drain pipes and I'm not talking the ones you can walk through...these were barely big enough to crawl through and I being a slightly chunky girl almost got stuck one day..that was my last time through...can you image rescue teams having to dig up the road to get me out!!??? Yowza, I was quite dumb! Apparently as a very young child I would love to swing and cry every time my parents tried to take me off the swing to go home. When we moved to the suburbs and had a swing set in our backyard I would love to swing in the evening and watch the sunset, or twist the swing so that you would spiral around getting dizzy and then try to get it to twist the other way and finally sit until the swing was totally still or "waiting for the cat to die" as my grandfather called it. I remember on Sundays my dad liked to take a drive to the beach after dinner to go fishing. My brother, sister and I would sit in the backseat (no seat belts in those days) and as dad would drive through the canyon we would slip and slide all over the back seat and giggle all the way to the beach. stunning quilt! My favourite memories are of childhood holidays on the beach in Devon. I think a favorite childhood memory is when my dad would come home late/early and wake me up to go eat breakfast at Denny's. We would have the best conversation over a grand slam. It's probably fresh in my mind as I just returned from a vacation in Disney World. But I can remember the first time my whole family went to Disney World. I thought the monorail was the coolest thing I had ever ridden. So you can imagine how excited I was once we were actually in the park! Thanks for the trip down memory lane and the great giveaway! My favourite childhood memories all involve our summer holidays to Lochinver, a little seaside village in the Highlands of Scotland.We always seemed to have the beautiful sandy beach to ourselves and in my memories it was always sunny. Now I live in Scotland again ( having been in HK) i know how precious those sunny days must have been!!! One of my favorite childhood memories is being woken by my parents with a new kitten, only to cry because I thought it was a dream and that I wouldn't really have a kitten when I "woke" up. Luckily, it wasn't a dream and I had that kitten for 18 long years. What a gorgeous design! My favorite childhood memory is the birthday party where my mother taught us all to sew! I think we were about 8 or 9 years old and we made simple backpacks. Thanks so much for the fun question and the great giveaway! one of my favorite memories was getting caught eating my mothers lipstick when i was about three, after i had put some on of course!!! i remember getting caught but not getting in trouble, perhaps she was amused!!! love the quilt...the wave of white along the backing is quite possibly my favorite part. I have a really vivid memory of my 8th birthday which we spent in Holiday Camp in Greece. They did all sorts of activities for kids to let the adults go off and sight see. It was all very organised, which I would hate now, but loved then. My birthday was Fancy Dress night and everyone was in costume in the restaurant and they all sang happy birthday too me as a birthday cake was brought out. It felt like one huge birthday party just for me. I would have to say bugging my brothers. Just in general. They are 11 and 12 years older than I am so I really enjoyed bugging them at every chance I could get. some of my favorite childhood memories are the weekends my brother, sister and I would spend at my grandparents house. The first weekend of every month was our weekend. Loved those times. Love the quilt too. so gorgeous. I LOVE this quilt!! What a perfect design for those fabrics. So very cute!! A favorite childhood memory is playing "little people" with my siblings, we would set up an entire city! Going for walks with my parents and brothers would have to be my favourite memories - I couldn't single out any particular one, it was just part of our life. Each summer we would spend a week at our family's cabin. We got to roam around without grown-ups. We would go blackberry picking and come back with loads of berries. My mom would turn them into pies, jam, cobbler, etc. My Grandmother and Mum always made us THE cutest clothes. We have the loveliest childhood photos with the best of clothes. At my Grandmother's funeral a friend came to my Mum and said that they were always impressed that they were the best clothed children during hard years after WW2. One of my Grannie's secrets was buying coats etc and turning them immaculately inside out, so they looked new. My favorite childhood memory is sitting with my Grannie while she showed me herringbone and other stitches! 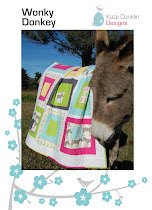 I LOVE your quilt and would love a chance to win the fabric and pattern! My favorite childhood memory was taking a 4 hour trip with my grandparents, my brother and sister and myself. You know the things kids say and do, "see my finger, see my nose, see my booger, there it goes"...well my brother was doing that and the booger went flying to the front of the car and ALMOST hit my grandpa in the head! My grandma says, "Daddy, what was that." And grandpa said, "Oh Mom, you're just seeing things." My brother and sister and I couldn't stop laughing! Very fun quilt. I'm SO envious of all you folks who are bale to get this fabric line already! I have to wait until APRIL!!! sigh. 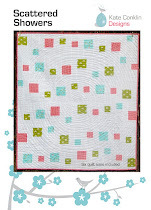 I have been trying to win some sherbert pips for a while, and I LOVE this pattern because I am wanting to try some new quilting techniques and expand my skills! I haven't tried any curved piecing yet. Let metell you about one of my earliest memories... when I was 2 or 3 we were living in a 2 family home and we had to move from the upstairs apartment to the downstairs. I wanted to help with the moving, everyone was going up and down the stairs, so my mom let me carry pillows down the stairs to the new apartment. It's all I remember so I must have gotten bored after that! But I felt special helping! A favorite childhood memory is playing all sorts of games outside with family and friends. Games like frozen tag, kick the bucket, Mr. Wolf, skipping, tag, and on and on. These are fond memories. Thanks for this awesome giveaway - I absolutely love your new quilt design "Sherbet Dreams" - I would want to make the same if I won!! Thanks! I SUPPOSE CUTTING MY SISTER'S HAIR WHILE MOM WAS SEWING, IS MY FAVORITE CHILDHOOD MEMORY! SHE HAD A CUTE PIXIE-CUT IN NO TIME AT ALL! sitting on my wooden swing. It was made by my dad and hung from the branch on an old elm tree. I spent so much of my time on it. I remember playing super-heroes with my sisters, with towels for capes. Thanks for the chance to win! I grew up with 3 brothers and I'm the 2nd oldest. In our younger days we lived in an old apartment in Queens, New York with 2 bedrooms. I was the lucky girl with her own, and the boys shared the other, my parents slept on a fold out in the living room. I remember fondly jumping on beds with my brothers, skipping church (bad I know) and going to White Castle across the street for hamburgers and cokes. Those were the days. Now we all live in different states and haven't been all together in probably 10 years or more. Since it was super stormy and cold this morning when I got up and was remembering being little and getting dressed in front of the wall heater at the little house I grew up in. My brother and I would always fight about who got to have the "better" side. thanks for the give away. Ooooooh I would love to win!! I remember watching a hurricane come in to shore from the seawall near where we were staying before we were evacuated. The power of the storm was incredible. When I was a kid, we used to spend summers at a basic camp up in Newfoundland. We had to get creative to stay entertained! My step-father organized a massive treasure hunt for my sister and I one year. It probably took us 3 hours or more to get through it all, and involved scrambling through the woods, finding clues under old railroad tracks, under the porch, tied to rocks by the river bank, and finally a grand prize of candy cleverly hidden in the wood stove. My step father is the best! I used to fight with my twin sister - A LOT. I remember once hitting her on the head with a stuffed elephant. Unfortunately, it was a musical elephant, and the winding key bonked her in the forehead and made a dent. Boy, oh boy did I get in trouble! The first thing that comes to my mind - picking fresh fruit in my grandfather's garden. I couldn't wait for Spring and early Summer. I remember riding my bike around the neighborhood. We didn't have hills like this quilt does, but it was fun! Thanks for the awesome giveaway, this pattern really does show off the fabrics perfectly. The only memory I have of my grandfather is sitting between him and my grandma in their red '63 Ford Fury. I was about 2. Grandpa gave me a butterscotch candy. He died when I was 2 or 3. I love this quilt! possiblly my favorite use so far, of this fabric. I remember spending days on end on my roller skates. We used to skate around and around the block, but when we'd get to our house, we'd go in the kitchen door, across the family room and out the door on the opposite side of the house. We'd hear my mom's voice trailing after us, "Don't skate through the house!" I like your pattern. It does look dreamy. I love your quilt! One of my childhood memories (that I'm not proud of) was when my brother and I tested the theory tested the theory that cats always land on their feet which involved a second floor balcony and a couch downstairs which resulted in the house needing to be treated for fleas. The major part that I am not proud of is us blaming our much younger sister. This quilt is just gorgeous. The fabric and the curved shapes just give it a lovely organic feel. I remember fondly as a child going to my Nana's after church every sunday. We would always stay for dinner and she would cook something delicious. I'd love to enter your wonderful giveaway - beautiful pattern! This fabric actually reminds me of one of my favorite memories. One Christmas when I was five or six, my dad was able to rent a little cabin at Lake Tahoe. They had TONS of snow that year and we went on an actual sleigh ride pulled by horses and we had those round disc sleds and we sledded up and down hills every day for almost a week. And I got my first manicure with a little panda bear decal on my thumb...I was in heaven! Thanks for the giveaway! I hope it finds a good home! My favorite memory as a child was peeking out the window when the Easter bunny was hiding Easter eggs! I guess that would be naughty. Since Easter is close that makes me think of that. It is still my favorite time of the year. One of my favorite childhood memories is playing kick-the-can all over the neighborhood with the kids on our street. I think I'm just dreaming of warmer weather! great GREAT use of the fabric!!!! My favourite childhood memory is of playing hide and seek in the lilac and caragana bushes. Favourite memory is my grandpa pushing me down the road in a pushchair reciting a naughty poem. Laughed so much! I have so many fabulous memories from my childhood. But one of the first that comes to mind is playing in the empty lots in my neighborhood with friends. We'd ride bikes, build castles, play tag and generally get really dirty. Thanks for the great giveaway and sharing this cute pattern. I really love your quilt. My favorite memory as an only child was asking my Mom ALL the time to get me a brother...It never happend but I sure remember I did ask her everyday. Lovely quilt. One of my childhood memories is shopping with my dad. He need a new shoe and he told me to help find the right one for him. After that nice treat to our favorite restaurant. Thank you so much for the lovely giveaway! Your quilt is beautiful! waking up to a handwritten and cartooned note on my breakfast plate from my dad each morning! Wow, that fabric is amazing, would love to have a layer cake. A funny memory when I was about 12 and my sister was 9 was riding on the snowmobile. I was driving just in a small area with my dad watching and within a minute I hit the basketball post and flew my sister off the snowmobile. She didn't get hurt and I remember thinking I was going to be in trouble because I could not stop laughing. thanks for doing a give away. i remember we used to go to visit my grandparents who lived about a 9 hour drive away. this was back when we did nothave to wear seat belts. my brother and i use to travel up in the back of my dads tray truck! One of my favorite memories is going to my first James Bond movie, Thunderball, with my dad. I don't know why it was just Dad and me at the drive-in theater, but getting to spend one-on-one time with him was very special. You see, I have 6 younger brothers. I miss you, Dad. You have made such a beautiful quilt! Thanks for sharing it with us. A childhood memory I have been thinking of recently is running like my life depended on it into the waves at the beach with my brother. That fabric reminded me of being at my grandparents farm. They had a huge tree with a swing in it made from a tire - but not the traditional tire swing. They cut the tread section off of about 2/3 of the tire. The sidewalls stayed intact and acted as handles and the rope was attached to that. I used to spend hours swinging while my grandmother, a retired school teacher, would quote Robert Louis Stevenson's poem, The Swing: "How do I like to go up in the sky, up in the air so blue? Oh I do think it the pleasantest thing, ever a child can do..." and so on. Great memories!! I would love some Pips - even 1/2 a layer cake would be just lovely! First thing that comes to mind is me hiding behind the couch, eating chocolate icing with a teaspoon - sounds disgusting to me now, but I remember I loved the secret 'naughtiness' of it at the time lol! I love how your "oops" ended up being such a great element in your quilt. The pips fabric reminds me of when I was a young girl. I loved to climb up in my uncle's tree in the front yard and read Trixie Belden mysteries until the mosquito's chanced me inside. This lovely fabric reminds me of skating and jumping out of a very high swing when I was a child! I can't wait to get some of this wonderful fabric!!! Oh, what a beautiful quilt! One of my favorite memories is picking raspberries with my grandpa at his cottage as a little girl. I think we ate more than we picked most times! I have an awesome memory of going on a walk on a school night with my whole family in the snow, knowing school would be cancelled the next day. It was so quiet and pretty and we never used to do things like that! It felt very special! This quilt is so dreamy! I really want to make one for my new neice who will be born in May. She's my baby sister's new baby. I can remember lip syncing to opera to entertain her when we were little. Usually when we were supposed to be quiet. We would both double over laughing. For some reason, I've been remembering the Christmas when I was 6. We lived in St John's Newfoundland; and I got a Bonnie Braids Doll for Christmas. My favorite childhood memory is when my dad would read to me. I loved the deepness of his voice and how safe I felt cuddled up to him. I love summertime...barbies and jacks and hitting the pinky ball on the outside wall in the driveway! Makes me wish I was a little kid again. In the backyard smelling the sweet peas lined up along the back of the garage. Thank you for a chance to win. Aneela's fabric is so so wonderful and you treated it well. One of my favorite childhood memories is when my brother, sisters, and I would just run - around the house outside barefoot in the grass. We loved playing together outside during nice weather. My favourite childhood memory is swimming in the sea with my little brother, who has downsyndrome, he always wanted to go deeper and further and me and my sister were always getting him back to the beach, and he was looking so happy when we did. In my memory the summers were always warm and sunny, my mum tells me they were not, we live in the netherlands. I would love to win the pips, and I adore your pattern! My favorite childhood memory is when I picked out my first puppy. It was pouring rain and she had gotten out of her pin so she was all wet. All her bothers and sisters were dry in the dog house. But I thought she was so smart for figuring out how to get out I knew she was the one. She was a wonderful dog for 12 years. What a gorgeous quilt! Thank you for a chance to win the pattern and the fabric! A fave childhood memory is flying down the street on my banana seat bicycle with my best friend riding backwards on the seat with me or riding the handlebars. Oh I would love a chance to get some Sherbet Pips... One of my earliest memories was sitting watching mum at the sewing machine as she made new clothes for my ragdoll and listening to Buddy Holly LPs whilst dad was out at work and my older brother was at school. She definitely passed on the sewing bug! One of my favorite childhood memories is helping my dad plant seeds in the garden every summer. Simpler times! Thanks for this giveaway offer. I love this line! My favorite childhood memory is of my three children when they were scooter age my oldest who is now 23 and deployed overseas was teaching his little sister who is 19 now and off to college how to use the scooter she had just gotten for her birthday. The love and pride of being the big brother teaching his baby sister how to do something new ... well, it is a treasured memory for me. I used to stay at my grandparents' house occasionally and it was a real treat for me to have a (very tiny) glass of my grandma's homemade dandelion or elderberry wine as we watched tv on a Saturday night - I felt so grown up, and naughty! Gorgeous Fabric, I would love to win some Sherbet Pips! One of my favourite childhood memories is sliding down my friend’s staircase on a mattress...very fun but we were so naughty! Fussy Fairytales Quilt Pattern Finished!